Scheduling a sit-down with Rob Williamson isn’t easy. After opening his third bar/restaurant in three years, he’s never been busier. This kind of quick success and expansion is unusual, so I was excited to sit down with him and see how he was able to tap into the neighborhood so effectively. New breed of Astoria bars that offer quality product and a more casual atmosphere. Beer program is more advanced than just the basic craft offerings. Mom’s offers brunch all day, every day. 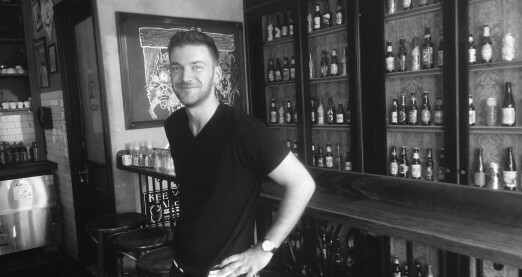 Originally from New Jersey, Rob started tending bar in midtown about 10 years ago at the House of Brews, owned by HKHG. He moved to Astoria to manage Oliver’s and has since become entrenched in the neighborhood. Note that he’s not involved in Astoria Craft, also owned by HKHG. Staff staff staff. “Once you have a core group of people who you can trust, who believe in what you’re trying to do, everything becomes easier.” Rob is constantly hiring. Besides the natural turnover rate for hospitality jobs, he employs actors and other creatives who periodically need time off for projects. Rob is enthusiastic about the bar scene in Astoria. He name-dropped a lot of places, including Astoria Bier & Cheese on Broadway and Judy & Punch on 30th. With more options in the neighborhood, the clientele is starting to edge a little younger, and craft beer continues to be a large part of the beverage program. Oliver’s tap list rotates regularly for this younger clientele interested in trying new beers. And there are always a few options for the growing scene of beer nerds. The beer options at Mom’s are fixed and lower-priced, part of its ‘comfort’ concept. Rob loves what he does…like, really loves it. If you’ve been to one of his bars, you’ve likely seen him bussing tables, washing dishes, running food, greeting guests – all with a smile on his face. Even when talking about the endless hard work of running three restaurants, he shines. There are a lot of 15-hour days. Running three bars means there is constant work to do. I asked when could I expect to see his fourth bar. He laughed and said that wasn’t happening. Maintaining three bars has Rob running around enough, a happy capacity. Rob sounds like a fabulous boss!